Both the Mayor and Transport for London have insisted again and again that the main reason they are building the death-trap junction at the end of Blackfriars Bridge is to accommodate higher pedestrian numbers. Pictured left, some of those pedestrians pictured today at lunchtime. 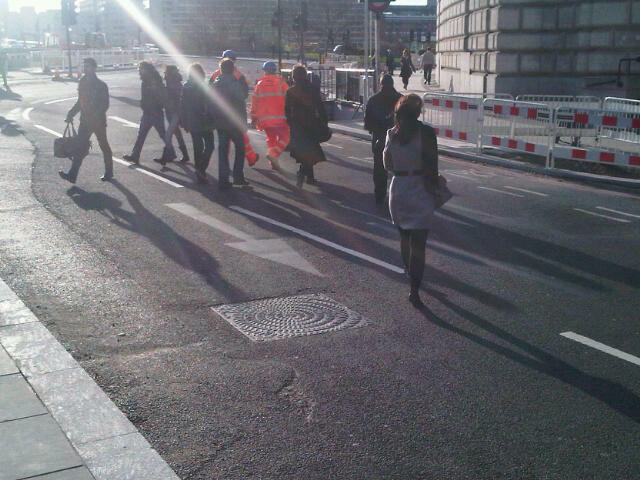 These pedestrians are crossing New Bridge Street towards Unilever House. As you can see, a lot of people cross the road here. And, until last week, there was a pedestrian crossing here. Then, over the weekend, TfL removed the crossings. You now have to take a circuitous loop and wait three times at separate traffic lights to cross New Bridge Street. Either that, or you take your chances and you cross in a straight line and just hope there's no traffic coming round the gyratory (you can't see it and it can't see you) and run across the now wider (extra lanes) and faster (TfL has raised the speed limit) road. Transport for London has removed the most obvious route for people to cross the road - a route that is clearly very popular. I don't think that's been done to make life easier for pedestrians. I think it has been done to make life easier for 'traffic'. The Mayor bangs on and on about 'smoothing traffic flow'. This is smoothing traffic flow in action. It's not just bad for cyclists, it's pretty crap if you're a pedestrian too. At a very basic level, Boris Johnson has encouraged Transport for London to make it harder, more dangerous and less pleasant for everyone to get around. Unless they're in a car. To the extent that the Mayor's press team now regularly boast in their pre-election pledges about how many pedestrian crossings they are removing to make it easier to drive your car instead. 'Traffic lights have been re-phased, I have noticed a great improvement, allowing quicker, better journeys in between the main roads.' ie, it's easier for me to go faster down rat-runs which are the streets where other people live and have to put up with more and more motor traffic? I think this is a Mayor who wants to claim 'I have made London less congested' as a major campaigning point. Firstly, it's a bit of a moot point whether he has or hasn't. But what he certainly is doing, is making London's roads faster, nastier and more dangerous - with increases in cycling and pedestrian deaths and serious injuries starting to show in the statistics. As Brian Paddick - LibDem mayoral candidate - pointed out in an interview with London SE1 website week: One of Boris Johnson's first acts at City Hall was to tear up the old road user hierarchy which placed the needs of those on foot or bike above those of motorists. Paddick is unambiguous about what his approach would be....you cannot have a roads policy that puts people's lives at risk. We are seeing a significant increase in fatalities, particularly of cyclists". After yet another woman was killed on a bike at Kings Cross recently, Leon Daniels of Transport for London told the Evening Standard that TfL would change the road junction here to make 'appropriate improvements for all road users'. That language is code for saying that TfL is going to add some advanced stop lines and not a lot else. AsEasyAsRidingABike blog completely and utterly demolishes the plans for Kings Cross on his site here and points out "Transport for London have chosen minimizing queueing times for motor vehicles over the safety – indeed, the lives – of vulnerable road users on their network." TfL has done that because the Mayor has told them to reduce congestion by making roads more efficient for motors. Now, he could have reduced congestion by getting more people feeling safe enough to cycle. The majority of car trips in London are under two miles (TfL stats). There's no reason some of that couldn't switch to cycling instead. But that will never happen on roads where people feel threatened by increasing volumes of faster and faster motor vehicles. Compare that with Utretcht in the Netherlands which actually removing an urban dual carriageway and turning it into a canal. Because they don't need as much road space any more. The traffic's still there. But it consists of people walking and cycling instead of driving. I think that Boris Johnson's policies are killing and maiming more people. And I seriously doubt they will make much difference to congestion at all. Leon Daniels is quoted in another Evening Standard article, talking about the site where Ellie Carey was killed on her bike a couple of weeks ago: "we will examine whether there are measures which could be incorporated to address any cycling issues highlighted by this incident". You couldn't be more weasel-tongued if you tried. What this says is that the Mayor and his transport authority know this is a danger spot but will do absolutely nothing about it other than tweak a few little 'appropriate' interventions here and there. Little tweaks that may or may not have any impact but will make it look like TfL is doing something. When in reality it's doing nothing. Nothing must come in the way of reducing congestion. A couple of weeks ago, the Mayor announced he would conduct a formal review and consider how he could change London's road infrastructure to make our city a safer and more convenient place to walk and cycle. He announced an immediate review of cycling facilities at all major schemes planned (ie future plans not existing junctions) and all junctions on Super Highways (ie on a handful of roads). What I can't understand is why that review is so complicated. In my mind, it's quite simple. Create safe space for people on bikes, keep them away from lorries and buses, especially (but not exclusively) at junctions. Make it easy to navigate through big junctions in particular. I've mentioned previously how TfL knows all this stuff already. They've studied it for years. They're just choosing to ignore it at the moment. While the Mayor faffs about his new review, look at what's happened at Bow, where two people have already been killed cycling this year. As DiamondGeezer blog points out, a nice sign has gone up. He rightly says: "there's a heck of a lot still to be done to make this interchange safe for cyclists and pedestrians alike. Erecting signs at a death trap doesn't actually improve anything, it merely highlights how bloody dangerous the design was in the first place." Once again, here's a Mayor who is sticking two fingers up at Londoners. If you're killed because the Mayor thinks it's important to remove pedestrian crossings or because he doesn't have the balls to install proper, safe cycling crossings, then all you'll get is some big words from Transport for London. A few weeks later, a couple of signs will pop up. And hey ho, everyone will continue as if nothing's changed. Because the Mayor must be seen to make it easier to drive around town. Which is why we're seeing more people who are cycling or walking being killed and seriously injured on London's roads. "Unilever circus (ie Blackfriars), how long before a major [road traffic accident] happens Who designed the new layout, stevie wonder". Bit crass but it makes the point. He carried on: "reckon tfl have a sweepstake on what day the first [road traffic accident], be careful out there". Cab drivers get it, cyclists get it, pedestrians are starting to get it. Anyone else needed before the Mayor rejoins the rest of the planet? This review of the Cycle Super Highways had better be good. Because it is going to have to make a massive break with what's being done in the Mayor's name at the moment. Otherwise, he might as well not bother. I used to cycle across Blackfriars every day, but I've now given up. Going southbound the interim arrangements are downright scary and northbound there's a massive conflict just beyond the lights at the end of the bridge where bikes and cars fight for space. ...And the new road layout is going to make things worse. How long until there's a death there...? They don't seem to care about safety as long as the traffic keeps moving (sort of). The cycle lane which crosses the bridge northbound, and which was installed to replace the "Cannonball Run" mid-road cycle lane following the death of Vicky McCreery, actually isn't too bad. It isn't physically segregated, but it is 2.5m wide and mandatory, and by and large observed by four-wheel vehicles (pity about the motorbikes though). The cycle bypass round Unliver Corner, protected by a kerbed median which has now been rebuilt following the other layout changes, isn't bad either. So it's a shame they couldn't manage something decent for the bit in between. Sure, we have a mandatory lane but it is about as narrow as design rules permit - possibly 2m but it certainly looks narrower. All this after intensive lobbying, flashrides and individual letter-writing to the maypor and TfL, a few cosmetic changes at best. Hardly surprising, when it is evident that people (plural) can be killed at the same site within weeks of each other and still they don't listen and they don't react. I used to think that even Bojo could be persuaded, but now I am sure that is not the case. We should just get on with it and vote him out of office in 2012. It's not as if his other policies or views, eg on the European Union or mollycoddling the City's biggest welfare spongers, encourage one to do otherwise. If a raised kerb had been installed in the "middle" bit, would it have helped? It coulld have made it more dangerous by forcing faster cyclists into lane 1. It would have been better for less confident cyclists though. I know this has been mentioned before, but I wonder whether a legal challange to TFL might be of some worth? So my thoughts are how can TFL effectivly say that despite very serious and obvious danger being present, they are un-willing to make changes to road layouts? Surely putting anything as a priority above public safety is unlawful? They are a revenue collecting agency, which puts them under more pressure from legislation. Maybe this has already been looked into, or is a crap idea, but with the London Assembly seemingly toothless, and our glorious mayor behaving so appallingly maybe a judge might have some sway? My own limited experience of judicial review is that it is very difficult and you are unlikely to win. A better prospect, and probably higher profile so might shame TfL into action, is for a bereaved relative to join TfL as a defendant in any civil action they take for damages against the driver and/or operator of the HgVs concerned. Snag of course is that the relatives have quite enough distress and sorrow to handle without having to add this to their burden. It would be a huge public contribution for them to make but a really big ask. Managed to make it to the advanced stop zone this morning coming off Embankment - makes a change. Another cyclist joined me who had to ask where traffic going across the junction into Queen Victoria St is meant to go - the junction is so badly designed it's not entirely clear where you're meant to go! Needless to say, on pointing him in the right direction, he had a few not-so-family-friendly words under his breath! I was looking at Google Maps and I found this junction in Greater Manchester. A crossroads between two major roads with proper crossings for cyclists that aren't shared with pedestrians, and a short stretch of cycle track leading onto a side road. You can make a right turn here safely without needing to move into the "fast lane", and the left turn slip lanes also have crossings over them. The cycle lanes surrounding it might not be that good (there are cycle tracks to the north that appear to consist of abandoned slip roads), and I've never actually used it, but having facilities like that is a refreshing change to the cycle lane that gives up at a junction, or the shared use crossing complete with awkward chicanes. I love the rephasing of traffic lights - NOT! Now I have to wait twice as long (at least) to cross the road to the tube station every morning. So the logic seems to be hold up those using tube trains to let the cars go past. This is wrong.